San Francisco kindergartner Evelyn Yu stared down Harry the sheep and then grabbed a handful of raw, yellowed wool on display next to the animal's pen in the Gordon J. Lau Elementary school yard. "You can make your clothes out of that," said the girl's teacher, Denise DeLeon. Evelyn wrinkled her nose and appeared unconvinced. 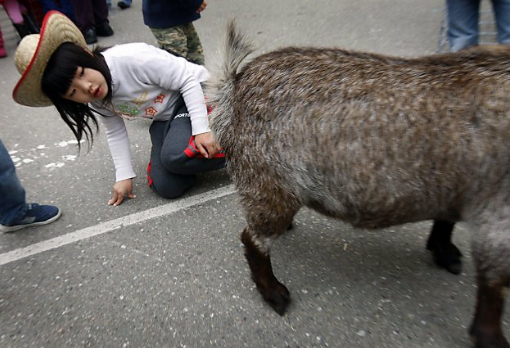 "It's too dirty," the 5-year-old said before walking away to check out Jerry the pygmy goat. Across the city, thousands of urban students on Thursday got a first-hand look at where clothes and food come from, thanks to contributions from animals like Harry and Jerry as well as Norman the calf and Fillmore the turkey for the 25th San Francisco Farm Day. "When kids think milk comes from the grocery store, we have a problem," said Kenny Watkins, chairman of the California Foundation for Agriculture in the Classroom. "We need for them to make the connection that California has the most abundant and safest food in the world." Students at Lau lined up to learn about the life cycle of chickens and turkeys, walking past eggs, then day-old chicks and poults (baby turkeys). Then they stood before Fillmore, a big, white Foster Farms tom turkey - and brother of the turkey that received the traditional Thanksgiving pardon last year from President Obama. The event coincided with the Grand National Horse and Livestock Show at the Cow Palace this week. At other schools and at the Cow Palace, students learned how to milk a cow, hull rice and candle eggs, a technique to determine if they are fertile.